Paywalls on digital news sites threaten the accessibility of news. Trump’s nationalist policy has the international community jumping for joy. Elias: Frackets; What’s Yours Is Mine? Fracket culture is indicative of a wider crisis of selfishness on campus. Elias: Canadians These Days, Eh? Canada has increased its presence on the world stage. Elias: Breaking News! Just Kidding. Overuse of breaking news headlines contributes to desensitization and distrust. Americans’ heightened emotions are necessary to restore political stability. 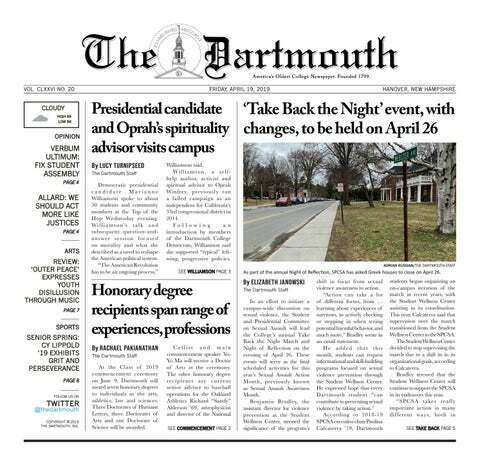 Dartmouth still retains a culture of female objectification after 46 years of coeducation. The allure of selective extracurriculars deters freshmen from creating their own community experience.